I think of myself as a ‘Christian’, but it puzzles me that most other ‘Christians’ seem to believe in something different from me. Basically I believe in Jesus. Many other Christians seem to have a different focus. Some seem to believe in the Bible more than in Jesus. I respect the Bible as the foundational text for Christians, but it is not what I believe in. I don’t sign up to the new–fangled idea that everything in it is literally true. 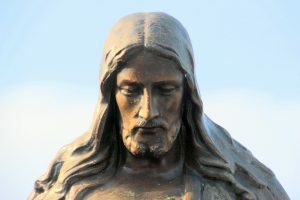 Many Christians seem to believe in the church more than in Jesus; that is implicit in their attitudes and actions, even if they wouldn’t admit it. Sometimes people develop entrenched commitments to particular aspects of church, whether it be the Book of Common Prayer, Catholic ritual or whatever. So what do I believe in? It seems to me, from everything I know about Jesus, that he inaugurated a new way of living and relating. If people catch on to it, it leads to a fundamental transformation of individuals, society and creation. Jesus called it his ‘kingdom’; that is what I believe in. If people got into it, it would transform the world for the better. The church is secondary to the kingdom. John Robinson, best known as the author of Honest to God, put it like this: “Have as high a doctrine … of the Church as you like, as long as your doctrine of the kingdom is higher”. Many Christians seem to want the church to thrive. I see it as a means to an end. Most church people don’t seem very interested in Jesus’ kingdom, or perhaps they write it off as some ‘pie in the sky’ impracticality. So, we have this strange situation of many church people not being really committed to the things that Jesus believed in and worked for; church people tend to believe in church instead. One of my favourite books on Jesus is God is No More by Werner Pelz. The title is very misleading for such a passionately religious book. It seems to me that Pelz’ Jewish background helps him to get Jesus (‘Yeshua’ as people probably called him) in a way that is rare. Pelz conveys Jesus as promising everything and persuading us it can really happen. Another favourite book on Jesus (or at least on how Jesus is presented in John’s gospel) is Stephen Verney’s Water Into Wine. He gets how Jesus transforms everything he comes into contact with, liberating people from egocentricity. I find Jesus really inspiring, and I think a lot of other people would find him inspiring too. If only the church focused more on Jesus it would do better. I have beliefs about Jesus too, and will blog about them shortly, but my enthusiasm for Jesus starts with what he said and did, and what he set out to achieve in those around him.